Which of the constellations in the night sky do you recognise? I wonder if one of them is the seven sisters – “Pleiades”. In a fascinating chapter of Cities of Dreams, Gooch sets forth the evidence that this undistinguished group, made up of fourth-magnitude stars—not particularly brilliant—was not only known to our ancient ancestors, but appears in the mythology of many disparate peoples, and in exactly or nearly exactly the same context. For example, for the ancient Greeks, the story went like this: Orion the hunter came upon six sisters and their mother one day in a wood. Burning with lust, he chased the sisters through the wood for five years, whereupon Zeus took pity on the girls and changed both them and Orion into stars, hence the constellations of Orion and the Seven Sisters. Strangely, a very similar myth exists among the Aborigines of Australia. Wurrunna the hunter was out in search of game, when he too came upon a group of seven girls. He grabbed two of them and took them as wives on the spot. However, the trees in the forest took pity on the girls and suddenly grew to a tremendous height; the five free sisters climbed to the sky, as did the other two, thus escaping Wurrunna……..The Pleiades are always known as the Seven Sisters, and they are always hunted. 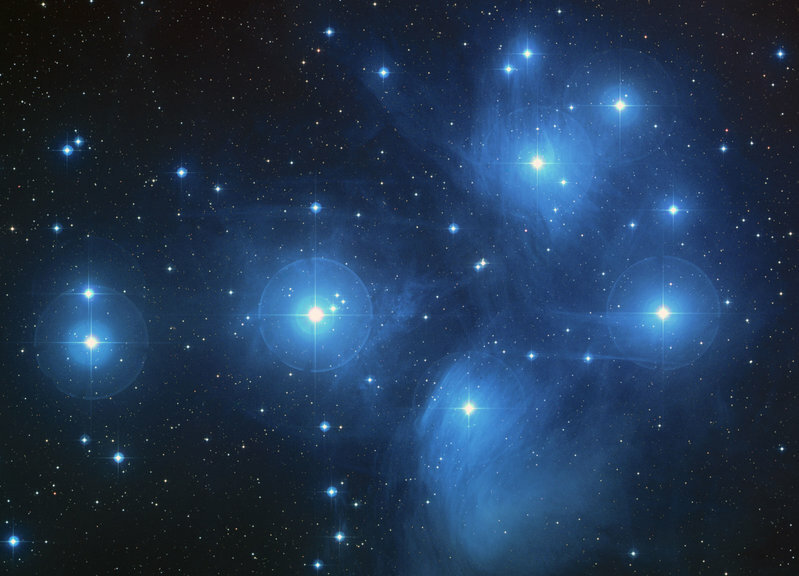 Likewise, they always escape, either through magical means or through the intervention of a god………The Pleiades also have the unchallenged distinction of being the only constellation noted and named by every culture on the planet, past or present. The night sky has always fascinated me. I love the way we humans connect up the individual stars with invisible lines to create constellations, which we then don’t just name, but tell stories about…..stories which help us make sense of the Life and this World. But how did this happen? How did we end up with such similar clustering of stars and such similar stories attached to these clusters (or constellations)? I find that especially fascinating when there are these close similarities in the stories of such disparate and disconnected cultures.